Limousin 209.5p (x2) Barrow Ling, 189.5p, 188.5p Houghton House. Limousin £1,215 (x2) Barrow Ling, £1,042 Houghton House. Limousin 134.5p Shaw Cottage South, 112.5p Howard House. Limousin £866 Howard House, £807 Shaw Cottage South. Simmental £778 Shaw Cottage South, £777 Archerbeck. OTM cattle were dearer on the week peaking at 172.5p & 159.5p from Messrs Ritson, Swaites and 164.5p & 157.5p from A. & A. Ewing, Dumbretton. Limousin 172.5p, Swaites, 164.5p Dumbretton, 159.5p Swaites, 157.5p Dumbretton. Limousin £1,200, £1,118 Dumbretton, £877, £845 Swaites. A much larger show of 550 spring lambs were forward to a full ring of buyers. 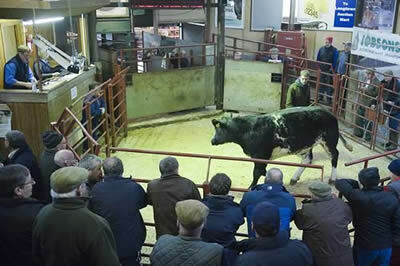 All classes met the best trade seen anywhere this week averaging 193.8p per kilo. Heavyweight lambs demanded a strong price per head with handyweight lambs keenly sought after. Many more could now be sold to advantage. Top price of £99 per head for Suffolks from Sceughdyke and Hallburn, and to 223p per kilo for Texels from Creca Hall. Texel 223p Creca Hall, 214p Hermitage, 211p Kirkbride and Middle Farm, 210p Broomhills (Sloan), Parknook and Waterside, 207p Hermitage. Suffolk 206p, 205p Hallburn, 204p Waterside, 202p Sceughdyke, 200p Hallburn. Charollais 205p Hallburn, 194p Mossband Hall. Suffolk £99 Sceughdyke and Hallburn, £94 Waterside, £92 Hallburn and Westend, £87 Sceughdyke, £86.50 Hallburn. Texel £99 Spawell, £98 Kirkbride and Creca Hall, £97 Broomhills (Sloan), £95 Hermitage and Burnfoothill, £94 Hermitage. Charollais £82 Hallburn, £80 Mossband Hall. A much smaller show of 2,060 prime hoggs were forward to the usual ring of buyers. An excellent show of heavyweight hoggs were a lot dearer on the week with all other classes similar. Well fleshed hoggs realising a premium, with lighter plainer sorts harder to cash. Overall sale average of 160p per kilo. The sale was topped at £102 for Texels from Messrs Fisher, Lairdlaugh and to 196p per kilo for Texels from Messrs Marrs, Broomhills. Texel 196p Broomhills (Marrs), 191p Lairdlaugh, 188p The Ash, 186.8p Lairdlaugh, 183p Steilston. Suffolk 191p Netherplace, 177p Swaites, 173p Geltsdale, 172p Pityot, 167.1p Swaites. Hill Cheviot 180p Golden Lane, 176.7p Clonrae, 175p Golden Lane, 174p West Scales, 170p Clonrae. North Country Cheviot 179p Pityot. Blackface 171p Clonrae, 170p Broomhills (Marrs), 169p Stoneraise Place, 168p Clonrae and Burnfoot, 166p Clonrae. Greyface 171p Golden Lane, 164p Swaites and Netherplace, 156p Drinkstone and Pityot, 155p The Ash. Shetland 169p Golden Lane, 161p, 160p Pityot. Herdwick 143p Sykehead and Branteth. Swaledale 133p Maidencots, 132p Patties Hill. Texel £102 Lairdlaugh, £99 Tercrosset, Lairdlaugh, Linton Farm and Maidencots, £98 Cruise Farm, £96 Patties Hill, £95 The Ash, £94 Broomhills (Marrs) and The Ash. Charollais £100 Wood Farm, £91 Roanstree. Suffolk £99 Whitfield, £90 Netherplace, £89 Bidlake, £88 Graystale, £86 Sykehead. Hill Cheviot £94 Tister and Cruise Farm, £90 Broomhills (Marrs), £87 Tister, £82 Mainside and Cruise Farm. Greyface £88 Pityot, £85 Drinkstone, £80 Netherplace, £79 The Ash, £78 Hudspeth. Blackface £83.50, £81.50 Broomhills (Marrs), £75 The Ash, £74 Hudspeth and Clonrae, £68 Broomhills. Beltex £92.50, £80 Cruise Farm. North Country Cheviot £75 Pityot. A similar show of 3,184 cast ewes and rams were forward to the usual ring of buyers. Trade similar for all classes apart from overfat ewes. Small plain ewes short of requirements. Tups remain dear. Texel £156 Bardnaclaven, £136 Beckfoot, £134 Heatherglen, £130 Raggetsyke, £129 Heatherglen. Charollais £132 Chaseside, £130, £120 Beckfoot, £120 Carslae, £117 Heatherglen. Suffolk £128 Bardnaclaven, £118 Heatherglen, £116 Bardnaclaven, £114, £113 Chaseside. Beltex £120 Wood Farm, £108 Fellview, £106 Hillside, £105 Wood Farm, £96 Creca Hall. Leicester £114 Hole of Lyne, £106 Crowhall, £104 Newbiggin, £102 Raggetsyke, £98 Mosshead and Bailey Mill. Roussin £110 Heatherglen, £96 Westerhouses. 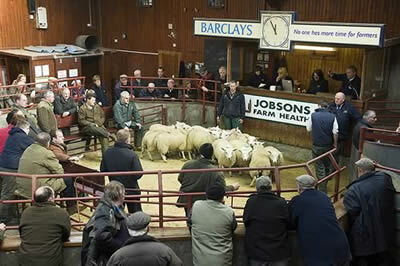 North Country Cheviot £108 Bardnaclaven, £95 Lower Gills, £93 Sornfallow, £92 Beckfoot, £90 Mosshead and Tister. Greyface £92 Ringliggate, £90 Broomhills (Sloan), Pitogarty and Newbiggin, £88 Leithanhall and Merrick, £87 Pasture House, Kirkton Hill and Torgorm, £86 Heatherglen and The Flatt. Cheviot Mule £94 Heatherglen, £91 High Stenries, £84 Clarghyll, £81 Eskdale Street, £76 High Stenries and Tister. Bleu d’Maine £80 Pasture House. Blackface £85 Crowhall, £77 Burnfoot, £74 Crowhall, £72 Whitfield, £71 Tecket and Drinkstone. Hill Cheviot £82 Westerhouses, £78 Pitogarty, £74 Geltsdale, Priesthaugh and Springwell, £72 Mainside, £69 Dalgare. Jacob £76 Thorns, £74 Golden Lane. Swaledale £76 Milescott, £75 Bullshill, £73 Bailey Mill, £71 Tecket and East Unthank, £66 Hole of Lyne. Easycare £70 Heatherglen, £69 Pasture House, £68 Westerhouses. Kendal Rough £65 Little Galla. Charollais £162, £148 Chaseside, £142 Geltsdale, £135 Carslae, £124 Heatherglen. Texel £154 Howgillside, £150 Viewley, £148 Beckfoot, £144 Whitfield, £140 Heatherglen. Suffolk £152, £138 Heatherglen, £137 Viewley, £136 Heatherglen, £128 Viewley. Leicester £132 Viewley, £128 Burnfoot, £112 Patties Hill. North Country Cheviot £132 Tister, £122 Viewley, £114, £94 Heatherglen, £92 Sornfallow. Dorset £124 Beckfoot, £120 Heatherglen. Hill Cheviot £114 Satchells, £106 Priesthaugh, £96 Springwells, £92 Bardnaclaven, £82 Mainside. Lleyn £112, £90 Whitcastles, £85 Westhills, £84 Hillside. Blackface £85 Burnfoot, £82 Ringliggate, £78 Heatherglen.